On Election Day in 2018, Washington voters passed an ordinance to curb local governments’ efforts to pass additional taxes on grocery items, including meats, beverages, produce, dairy, grains, and more. The 55-45 percent vote was no doubt a win for the consumers, but so far reaction to the local tax ban has been negative. Why? For one, most media coverage focused on the soda industry’s support of the measure, no surprise there. But considering most news media reported this and voters supported it anyway, what does that mean about the initiative itself? Overall, this was primarily a ballot question on funding and taxation, not on a particular public policy. Voters are usually cautious in supporting new taxes, and are more likely to support proposals that would ban certain taxes. The disparity that occurs in food prices between city and county jurisdictions are high enough to give plenty of people a headache. Depending on the county and city you live in, Washingtonians must pay between 7 and 10.4 percent in sales tax, including the state sales tax of 6.5 percent. 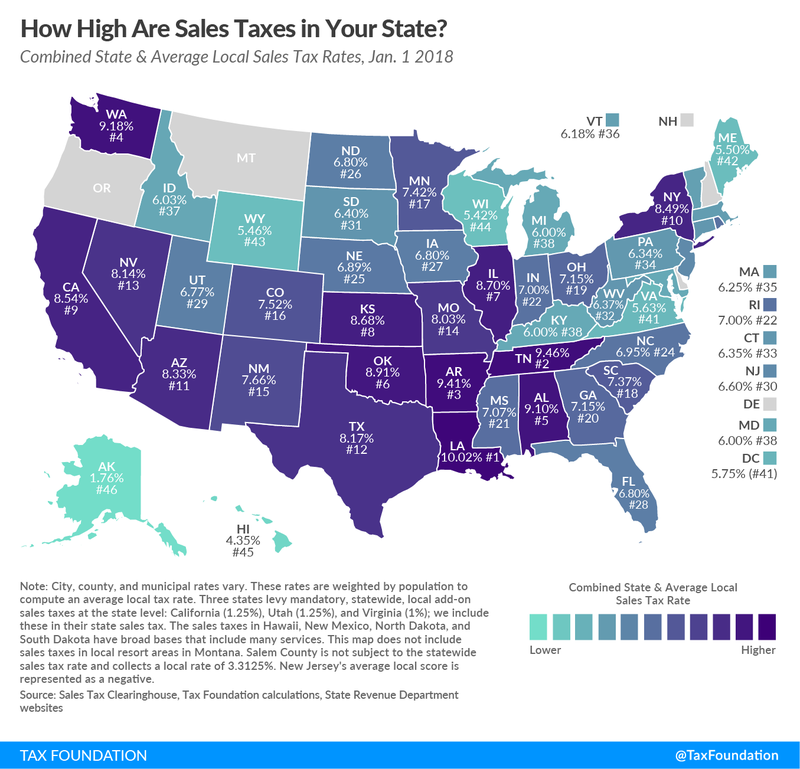 According to the Tax Foundation, Washington has the 4th highest combined sales taxes in the country, averaging out at 9.18 percent. For the average family, that means nearly a tenth of every grocery bill must be paid in taxes. Not to mention property taxes, federal income taxes, fees, and more. The list is endless. If asked whether they should be increased, it’s hardly surprising voters decided against it. An argument can be made that autonomy to tax is being taken away from local jurisdictions, but a discriminatory tax regime across county or city lines won’t do anything to help consumers. As we have seen in places such as Philadelphia or Chicago, consumers are more likely to travel across those lines to buy what they want at a bargain. One analysis found that while sales on sugary drinks fells in Philadelphia after the soda tax was passed, sales on those same beverages jumped 38 percent at stores outside jurisdictions. In the name of pursuing health policy, why should we force residents to travel across city or county boundaries to buy their groceries? Not everyone agrees with this sentiment, of course. In neighboring Oregon, former New York City Mayor and billionaire Michael Bloomberg dropped $1.5 million into the campaign to strike down a similar local tax ban. That effort ultimately didn’t pass, meaning cities and counties will be free to pass their own grocery taxes at will. For Washingtonians on the north bank of the Columbia River, buying groceries in Oregon is almost a sacred ritual, owing to its 0 percent sales tax. Now, emboldened by the ability to pass local taxes and encouraged by health crusaders like Mr. Bloomberg, cities and counties may look to raise additional revenue. As such, Washington residents should be both proud and relieved. They won’t be seeing their grocery bills climbing any time soon, and that’s because they voted with their wallets on Election Day. They should be praised rather than condemned. As the Consumer Choice Center has been keen to point out in several articles and campaigns, additional taxes and levies on sugary drinks end up being regressive and hurting the very people they aim to help: minorities and the poor. Now, minority leaders in Philadelphia, seeing the toll the taxes have had in their communities, are calling on the city to repeal them. As reported in the Philadelphia Inquirer, black clergy leaders say the taxes are disproportionately hurting African Americans and the poor in the city. “I don’t see how the tax, as it is constructed, can really effectively do what it is intending to do. We think it needs to be repealed and reconceptualized,” said the Rev. Jay Broadnax, president of the Black Clergy of Philadelphia and Vicinity. Last year, Cook County, which includes Chicago, got rid of its unpopular 1-cent-an-ounce soda tax that its commissioners passed in November 2016 affecting 5.2 million residents. When Philadelphia passed its soda tax in 2016, it was the largest U.S. city to implement such a fee. After the tax was implemented, shoppers chose to cross the city limits to purchase their sugary drinks, something we have also seen in places like Seattle and Chicago. Former New York Mayor Michael Bloomberg, the architect of soda tax campaigns across the country, spent over $1.6 million in Philadelphia alone to help pass the tax. During that year, he also dropped $18 million in Oakland and San Francisco. As I pointed out in my Washington Examiner article last year, Bloomberg is no doubt driven to do good. But whether soda taxes are the tool to help reduce obesity remains to be seen. In Washington State, campaigners were successful in passing a ban on local grocery taxes. In large measure, this ban will ensure localities cannot pass their own taxes on ordinary goods Americans purchase at the store: meats, beverages, produce, dairy, grains, and more. As such, Washington residents should be both proud and relieved. They won’t be seeing their grocery bills climbing any time soon, and that’s because they voted with their wallets on Election Day. Whether policymakers at the city level will see the harmful effects of passing such taxes, however, remains to be seen. If they listen to the leaders in Philadelphia and other jurisdictions, they will think twice.